No sé a vosotras, pero a mí siempre me han encantado las estaciones de tren. Me parecen entrañables (quizás porque durante años trabajé como azafata en trenes internacionales) y muy románticas. Si también tiene un punto de tristeza por el tema de las despedidas, ¡pero yo prefiero quedarme con el recuerdo de los reencuentros! ¿A vosotras también os gusta viajar en tren? I don’t know if you feel the same but I’ve always loved train stations. I found they’re touching (maybe ‘cause I worked for years as an hostess in international trains) and very romantic. Yes they do have a sad air because of the goodbyes, but I prefer to keep only the "re-encounters" in my memory!! Do you also like to trains as much as I do?? Love these shots in the train station! Love the shoes!! Guapaaa,me encanta el look!Las sandalias y el bolso ,me chiflan!!!!! I actually like trains a lot. I take one every once in a while when I don't feel like driving back to my home town to visit my parents. Love your casual chic outfit! me encanta como te quedan esos boyfriend! =) estas guapisima! no conocia tu blog, me uno ya mismo! Love the boyfriend jeans, they look great on you. I love stripes! This is a classic yet modern look. Love it! luces muy linda con esa blusa de líneas y zapatos neutrales! Cute blog! I love train stations too! nice place! Love your shoes! Not only is your outfit cute, but that's my go-to thing that I wear when I want to look dressed up, yet casual. I love striped tees and fringe necklaces with boyfriend jeans and wedges. Looks great on you! 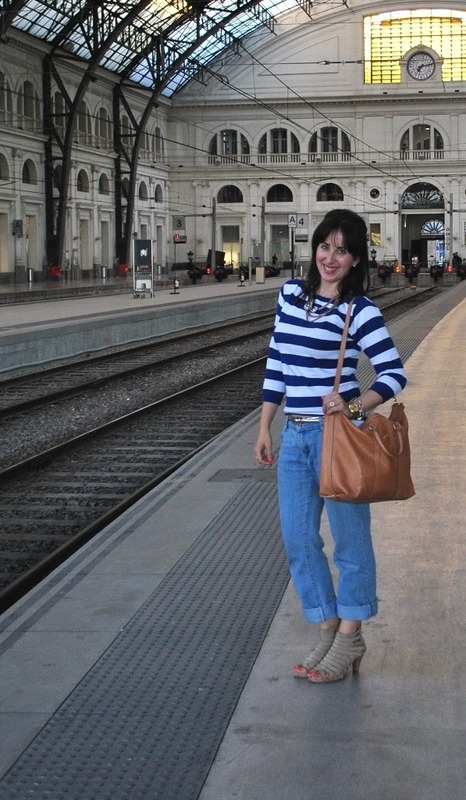 Hi dear, I love train stations too! Your look is amazing! I like your bag and jeans. i love your watch and bag! great! Que bonito el collar, me encanta. a mi me encanta viajar en tren!! ademas por mi profesión viajo muchisimo y cuando toca en tren toco las palmas jijij besitos!!! Great look! I like your boyfriend jeans! Me encanta viajar en tren. Un look muy bonito. I mean I have a weak spot for anything stripey and the brown bag goes perfect with it! Love your striped look! Great bag! Trains really are fascinating! I just wish we used them more in Canada for travel, they are so expensive to take here. A beautiful train station! I like your bag. great blog! 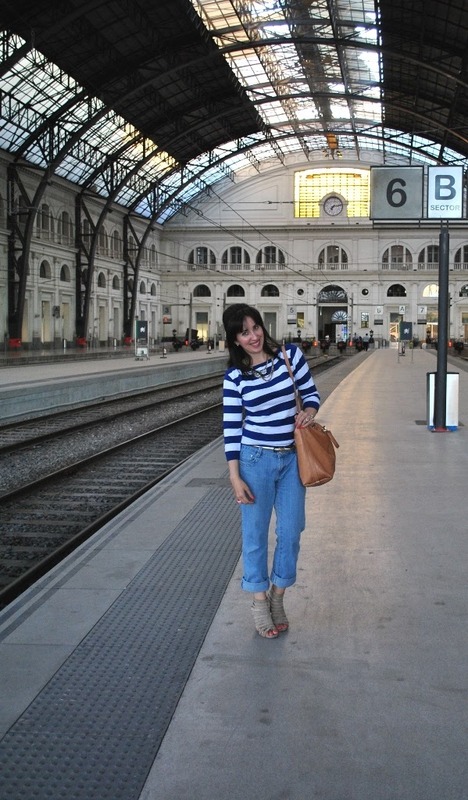 so glad i found u and am a new follower :) love this look with the stripes and boyfriend pants! Me encantan las camisetas con rayas! Stripes are so hot this season, I cant stop wearing them either. ME ENCANTA EL LOOK! yo también siento debilidad por las estaciones de tren antiguas... y si, si pudiera haría un viaje el transiberiano sin dudarlo!